Serbia is in many ways the unknown quantity of tourism in the Balkans. It has no equivalent of Kotor or Bled, Mostar or Ohrid - no single sight with the "wow" factor that is so useful in attracting visitors. This is all to the benefit of those travellers who do find their way to Serbia, not least for the chance to meet people who are far from being jaded by tourism. Serbia's key position on many transport routes makes it easy to visit for a few days as part of a longer trip. But it's worth staying longer to appreciate the gently rolling countryside, monasteries hidden in wooded valleys, towns as different as Novi Sad and Novi Pazar, and the urban pleasures of Belgrade. Belgrade, the capital of Serbia, was the capital of a much larger country for much of the twentieth century. It still has a dynamism and urban atmosphere that make the other former Yugoslav capitals feel a little provincial in comparison. Like many Balkan cities, an eventful history has left it without many conventionally beautiful buildings, but it compensates with a dramatic situation at the confluence of the Danube and Sava rivers. The rivers are overlooked by the Kalemagdan citadel, one of my favourite city parks anywhere in Europe, a wonderful place to enjoy an ice cream and an evening stroll along with the locals. Vojvodina, the northern part of Serbia, consists mainly of a plain whose monotony is relieved by the Fruška Gora hills and meandering rivers. The highlight is Novi Sad, a typically Central European city that like Belgrade benefits from its location on the Danube and a hilltop citadel. It's worth making the short trip to the pleasantly sleepy historic town of Sremski Karlovci. The region to the southwest of Belgrade, on the way to Montenegro, holds some of Serbia's most interesting sights. For many people mediaeval monasteries such as Studenica, Mileševa, or Ljubostina are among the highlights of a visit to Serbia. They are modest in size, but the appeal of their architecture and frescos is enhanced by their locations, often in tranquil and isolated valleys. See the FAQ for details of how to reach some of the monasteries. If you want to stretch your legs in the fresh air you could head for Zlatibor mountain. The summits here are low enough to be easily reached on a short hike, but high enough to afford marvellous views of an apparently infinite sequence of ever-higher mountains to the south. In the midst of those mountains is Novi Pazar, a strange mixture of Islamic and Socialist architecture and a good base for visiting yet more monasteries. A good way to enjoy the scenery of western Serbia is to travel to Montenegro on the Belgrade-Bar railway. Eastern Serbia is even less explored by foreigners, who tend to whizz down the Morava Valley transport corridor towards Bulgaria or Macedonia. Those with a little more time can enjoy yet more mountains, spas such as Soko Banja, and the Skull Tower in Niš (although most of the skulls have disappeared over the years). The fortress-like Manasija Monastery is also a highlight of the area. Serbia has reasonably good train services running from Belgrade north to Novi Sad and Subotica, southeast to Niš, and southwest to Užice and onwards to Montenegro. As in many countries in the region, the slowest trains are very slow indeed, so look for express services where possible. Away from these main lines you will need to rely on buses. In general transport is slower and more complicated southwest of a line drawn from Valjevo to Niš - travelling from east to west in this area can be especially tricky. Bus services vary greatly in speed and comfort. Belgrade has a well-organised central bus terminal, but some provincial stations are rather dingy and displayed timetables are not always reliable. Despite its small size Serbia shares borders with eight countries. Belgrade has excellent international transport connections in all directions. Even after the break-up of Yugoslavia, it still sits at the heart of the region's transport networks. If you spend some time touring the Balkans you are bound to find yourself in Belgrade at some point. The three main rail lines mentioned above continue respectively to Hungary, Montenegro, and Macedonia/Bulgaria/Greece/Turkey. There is also a good train service to Zagreb and on to Ljubljana. Most of these countries can also be reached by bus, which can sometimes work out quicker than the train. 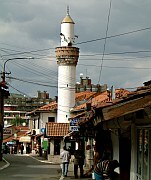 See the Bosnia FAQ for details of bus and train services to Sarajevo. There are surprisingly few options for getting to Romania by public transport, the most useful being the overnight sleeper train from Belgrade to Bucharest via Timişoara. If you will be travelling in your own car, check whether your insurance policy covers Serbia. This seems to be the case for most vehicles insured in continental Europe, whereas UK policies typically exclude Serbia. The code for Serbia is "SRB"; the old code "SCG" should be accepted until mid 2009, although there are reports that this is not always the case in practice. If you aren't covered you are likely to have to pay something like 135 euro at the border for one month's insurance - even if your intended stay is much shorter. Serbia's currency is the Serbian Dinar. Although you may read about a lack of ATMs in books published a few years ago, things have changed rapidly over the past few years and it is just as easy to obtain money from cash machines as anywhere else in Europe. Serbia is generally a fairly cheap place to travel, and hotels in Belgrade are typically better value than in most Eastern European capitals. The one thing that might push costs up a little is the fairly limited choice of accommodation in less touristy areas. Serbian is a Slavic language. You may read that a fundamental distinction between Serbian and Croatian is that they are written in the Cyrillic and Latin alphabets respectively. This is somewhat misleading, as Serbian can equally well be written in either alphabet. Serbian newspapers, for example, come in both varieties. In contrast to Bulgarian, there is a well-defined relationship between each Cyrillic character and its Latin equivalent, so you won't come across multiple versions of Serbian city names. Although knowledge of Cyrillic is not as essential as in Bulgaria, I do recommend learning it before a visit, especially if you intend travelling by bus (see The Cyrillic Alphabet in the Balkans). My impression is that the level of English knowledge is lower than in Croatia but considerably greater than in Bulgaria or Romania, especially among young people who often speak it quite confidently. You are certainly unlikely to have many language problems in Belgrade and Novi Sad, but you are quite likely to have to resort to the language of gestures in a rural bus station.